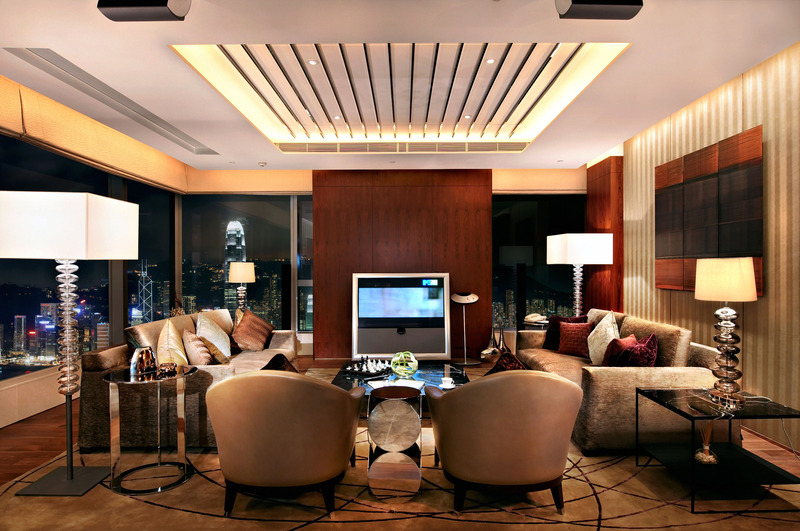 Taking luxury further once more, the leading Sun Hung Kai Properties have set the new benchmark for hedonism with this exquisite Presidential Suite, located in the stunning development of The HarbourView Place that just opened last year. Located next to the third tallest building in the world and above one of the most luxurious shopping malls in Hong Kong, The HarbourView Place is worlds apart from your average serviced accommodation – and not just in terms of elevation. Located on the 50th to 70th floors of The Cullinan II at the International Commerce Centre (ICC) complex, The HarbourView Place contains a total of 266 premium suites and this particular suite is the pick of the bunch, with the 70th floor penthouse featuring exclusive views, faultless decor by the team from Design Studio SPIN, plus a fine selection of materials and top-quality branded furnishings. With up to 2,500 square-feet of floor space, this Presidential Suite is already bigger than most standalone houses, and the generously-sized space features a master bedroom suite, a guest bedroom, a study room complete with a daybed, a living and dining area, plus an open-style kitchenette and a laundry room. However, with 2,500 square-feet of superior luxury, the suite is much more than just a bunch of specifications, and it comes complete with an eye-catching interior by the Tokyo-based team from Design Studio SPIN. The result is a contemporarily oriental interior, sprinkled with plenty of marble and other modish materials. At the entrance of the home one is greeted by an atmospheric foyer, stylishly decked out with metallic dragon sculptures, illuminated from behind by spotlights that shine onto red shades. Further in the main dragon sculpture marks the start of the corridor – with the bedrooms, study and laundry located off on the left; and the living and dining room located on the right. As with the foyer, more touches of orientalism appear in the living room, with the open-plan space enhanced with deep granite marble, polished wall columns and russet wooden floor panels. Edging off on the side of the lounge is the dining and kitchenette area, with these spaces covered by marble panels and illuminated by site-specific spotlights. While the dining area appears slightly formal and decorous, the living room is cushier and more inviting, with velvet cushions on the sofa, a pleasantly curvy-patterned carpet, an interesting light fixture and other appealing oriental decorations adding warmth. Some other louder attractions also prettify the area, with gently-sloping pyramid tiles enhancing the ceiling, illuminated glass display cabinets catching the eye from behind the sofa and a grey-brick wall standing out behind the 65-inch Bang & Olufsen plasma screen television. Some of the other modernisms in the living room include an electronic curtain control system, a Lutron light dimming scheme, plus a Siemens/Porsche Design coffee maker, kettle and toaster in the kitchen. Off from the back of the living room is the study area, which also has an entrance from the other side of the corridor. The two entrances open up the space of the room and give the front of the apartment a sense of fluidity. This fluidity also appears in the design scheme of the study, with more oriental motifs appearing on the lights and the red shelf, and an interesting framed ornament which corresponds with the wall of the behind the television back in the lounge. Further down the corridor, there is an individual powder room, plus a laundry room complete with lavatory. At the end of the corridor the two bedrooms come in as the main highlights of the home, with both featuring a similar design scheme. While the secondary bedroom features warm wood and luscious red and gold tones, the master bedroom features a brighter and more uplifting design scheme. The other differences include the fittings of course, with the master bedroom featuring a walk-in-closet and a swanky en-suite bathroom complete with a Jacuzzi, massage jets, a rain shower and an LCD television. Innovative and modish at the same time, it is touches like these that give this Presidential Suite its outstanding exceptionality.